WHEN IN DOUBT, PUT AN EGG ON IT | Jane Lear. Writing on Food and Travel. The last time I posted was way back in December, and I apologize for falling into arrears. 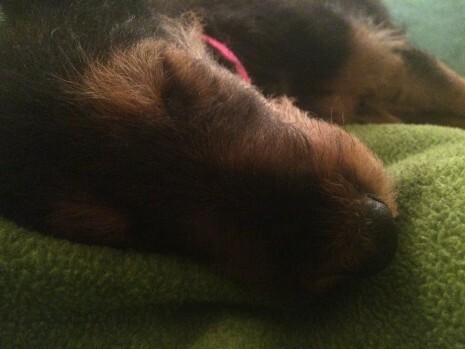 But not only did life become even busier than usual, it was complicated by the arrival of an Airedale puppy named Scout. Truth be told, I was not thrilled at the prospect of this development, but, all too predictably, I fell for her like a ton of bricks. Every time I sit down to write on the home front, however, she wants to go out. Or play. Or eat. Or play. Or go out. Or something. You get the picture. I wonder if I could teach her to type? Then I could just dictate. Anywho, life in the kitchen chez Lear has been pared down to the essentials. We’re ripping through the supplies in the freezer—including meatless soup beans, turkey chipotle chili, and blessedly convenient (and sustainable) fish fillets—in record time. Gingered butter dresses up the same-old, same-old broccoli, carrots, or cauliflower, and if we hadn’t been fans of mandarin and fennel salad, we never would have discovered that Scout adores clementine segments, even if they’ve been accidentally left out on the kitchen counter and have the texture of limp suede. Our scratch suppers, though, mostly involve eggs. There is no end to what you can enrich and embellish with a fried egg, for instance. Broccoli rabe or dandelion greens and toast. A warm lentil salad. A bowl of steaming-hot rice dabbed with the Korean fermented chile paste called gochujang. Pasta with or without mellow-yellow onions. Leftover scalloped potatoes, or plain old mashed. Corned-beef hash out of a can, which is completely underrated, if you ask me. Pomiane was one of the culinary world’s great renaissance men: A Pasteur Institute scientist, he also lectured on nutrition, hosted a radio show, and wrote a whopping 22 cookbooks, including French Cooking in Ten Minutes. His recipe makes one omelet; cut in half, it makes an excellent late supper for two people. In addition to the cheese, you can add some cooked mushrooms or chopped deli ham, tender herbs, or spinach. Heat butter in a 10-inch nonstick skillet over moderately high heat until foam subsides. Meanwhile, whisk together eggs and salt in a bowl. Pour eggs into skillet and cook, stirring gently with a fork, until they begin to set. Spread eggs evenly in skillet and sprinkle with cheese. Reduce heat to low and cook until omelet is just set. Holding skillet above a plate, tilt it until omelet begins to slide out and almost half is touching plate, then immediately invert skillet, as if trying to cover plate, to make omelet fold over itself. Cut in half and serve immediately. Lastly, a word about the eggs. 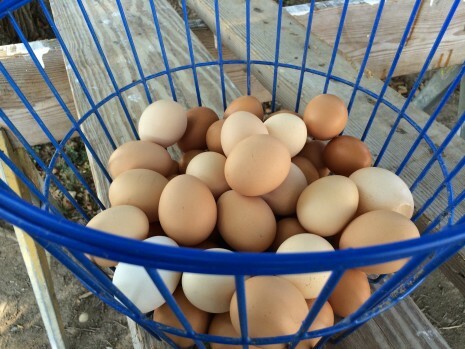 Really good ones, from genuine pastured hens, aren’t cheap, but they are one of life’s more affordable luxuries. If you’re curious about how (and why) yolks get their color, how to decipher a supermarket egg carton, or how beauty and biology enter the equation, thank the good folks at TakePart for giving me (and my readers there) free rein. Now, I have to go watch the puppy sleeping. Will write again soon. A typing dog! Why hasn’t anything been done about that?! Lovely article. I’m going out to get some eggs now.